High-performance B2B marketers are transforming their organizations to play a more strategic role, bringing insight and innovation, and contributing to greater revenue growth. Marketing’s influence is on the rise and it’s more than influence on pipeline and revenue. Marketing is on the path to become a strategic growth driver, forging new relationships, collaborating across traditional silos, and helping their companies to become more customer centric. 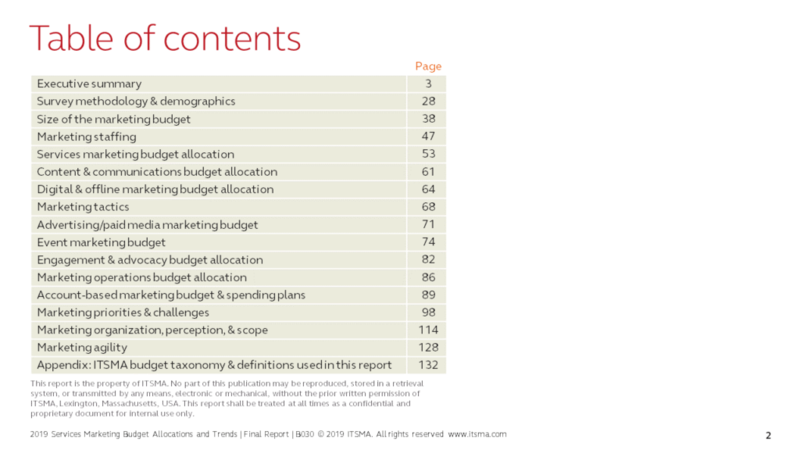 ITSMA’s 2019 Services Marketing Budget Allocations and Trends Study provides critical data and insight on the rise of marketing influence. In particular, the report examines marketers’ strategic priorities for 2019 and how these have changed in recent years, and marketing budget growth and allocation changes. The report also explores how marketing organizations are changing including the balance of digital and offline marketing tactics, the need to improve marketing agility, continued focus on account-based marketing, new marketing leadership roles, and the marketing skills in greatest demand. Along with essential new data on marketing budget trends and allocations, the study highlights the five specific ways B2B marketing leaders stand apart from the rest. 2019 Services Marketing Budget Allocations and Trends, a PowerPoint-style report, delivers a detailed look at the state of the services marketing profession as it exists in early 2019. It provides data on services marketing budgets, budget allocations, and marketing priorities from a range of companies across the technology and professional services industries. 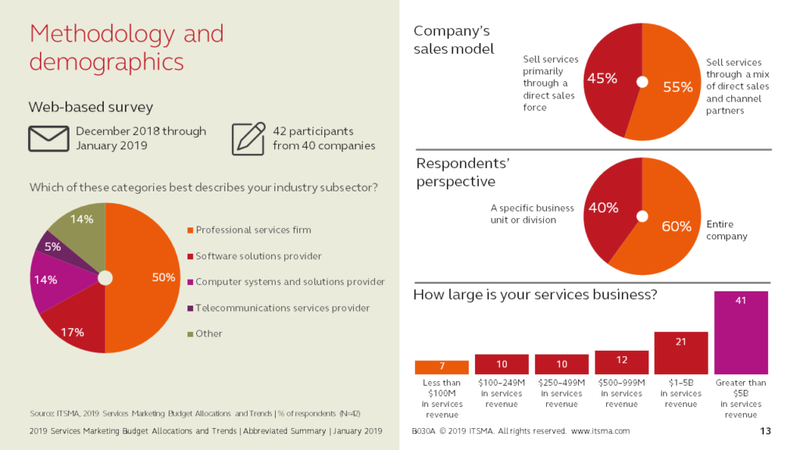 ITSMA gathered detailed data on services marketing budgets, trends, and priorities from a cross-section of large B2B technology and IT services firms with an invitation-only, web-based survey during December 2018 and January 2019. Survey respondents were 43 senior marketing and services marketing leaders at 42 global firms, roughly half product-based and half professional service firms, with 62% of the respondents from $1 billion+ companies. The full report is available at no additional fee to ITSMA member companies that participated in the study. Non-member companies that participated in the study are eligible to receive an Executive Summary. Deloitte Support Services India Pvt., Ltd.
WNS Global Services Pvt., Ltd. If your company is on the above list, please send us an email (using your company email) and request your copy of the report. Orders will be processed the next business day. For non-participating companies, this report is available for sale at member and non-member prices. This document is available at a reduced rate to employees of an ITSMA member company. It’s also available for sale to non-members.